Robert Spencer & Pamela Geller: Do NOT ban Islam ~ We can Coexist! That is right, unfortunately you have read the title correctly. I used to be a big admirer of what was dubbed as the “dynamic duo”, and really did not want to have to write this. But I would be failing the anti-Islam campaign if I did not. Lately the actions of Pamela Geller and Robert Spencer have been very questionable, while showing weak leadership. Part of my past support was based on the fact that they did tremendous work opposing the Ground Zero Mosque, and continued with an excellent subway ad campaign. But lately I have been seeing a different side of Geller and Spencer. A side that is disappointing, seemingly dishonest, and definitely suicidal. As most of you know Tommy Robinson recently defected from the English Defense League, while throwing thousands of good non-racist members of the EDL under the bus. In the ensuing days the Geller/Spencer duo did a double flip-flop by continuing to support him, then withdrawing their support, only to reinstate it days later. To me that is a sign of weak leadership. It is impossible to hold him accountable for Quilliam’s disingenuousness when he has not repeated it himself. Tommy is planning to start a new organization that is as free from Quilliam as it is from the EDL, and in that, and in his ongoing efforts to defend the British freedom and the vision of human rights that Judeo-Christian civilization has given to the world, we wholeheartedly and unhesitatingly support him. 1. She provided no proof whatsoever about his leaving Quilliam. 2. The part about him not repeating their mantra is easily proven wrong. One LOOK at his Twitter page shows that, and I find it hard to believe she did not know this. 3. It has been almost a month since she posted that article. Well guess what? He is still with Quilliam, and still promoting their message! Tommy Robinson ‏@TRobinsonNewEra 23 Nov I had a interesting + positive meeting of moderate and progressive Muslims today @QuilliamF including a Muslim captain in the British army. Did Geller say he was leaving them just to get the heat off of her? Or did Tommy lie to them, and if so why does she still support him? To makes matters worse Tommy has been promoting the failed notion that “moderate” Muslims are coming riding in on their white horses, and save us from the barbarity of Sharia Law. In other words, there can be a co-existence with Islam. Now “coincidently”, Robert Spencer and Pamela Geller are promoting the same suicidal message of co-existence with Islam. They have come out against the banning of Islam! Is that so dynamic duo? I am all for a ban of Islam, and so are a lot of people I know. Islam is stuck in the past, and that is where it belongs. I also find it very irresponsible of them to encourage non-Muslims to be against such a ban. Where has granting Islam legality worked out for the a non-Islamic host country? France, Russia, the UK maybe? Oh, I know….it must me Dearborn Michigan! I for one will not be joining the undynamic duo in rolling the dice that America will not become the United Sharia of America, by supporting that the ideology of the enemy, Islam, remain legal here. No way, now how. There will be no flip-flop here! We are in the midst of very serious war with Islam, and weak-kneed polices, and half-assed answers like believing “Islamism” is the problem, and not Islam itself, are only going to lead us to defeat. (That was not meant for Spencer/Geller) A defeat our future generations will sorely pay for! I would like to thank Pamela and Robert for all they have done, and I am sure they will do some more good work in the future. 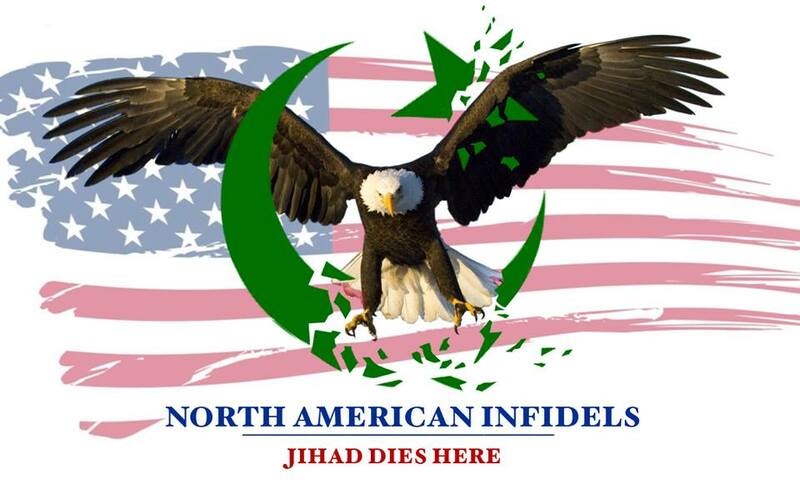 But between the Tommy Robinson fiasco and their willingness to help keep Islam alive in America, North American Infidels (NAI) will not be joining them in that suicidal message. Between them, and those who attempt to $ell us the fantasy of “moderate” Muslims saving the day, we certainly need new leaders in this war. Leaders and teammates who are uncompromising in their stand against Islam! Well friends, that team is being formed today! That team is North American Infidels. NAI fully stands against Islam, Muslim immigration, Mosque construction, and once again there will be no flip-flops here! We thank those who started this war, but now we need a team of closers! Join our team by “liking” us on Facebook now. While we are a young organization, we have quickly risen up to almost 8000 “likes, and will be adding educational brochures, email and phone campaigns, a new NAI website, and promotional materials to our anti-Islam arsenal in the near future! Stay tuned! ← CAIR Bully Cowers From Debate Challenge on the Red Fox Blogger Talk Radio Show! If Spencer, Geller and Robinson wants to co-exist with pislam, then I suggest they move to Soddy Barbaria and revert to pislam themselves. Because hell NO, I’m never going to co-exist peacefully with pislam! Never! Like that Dutch eidiot did recently? Remind my who that ducth eidiot is? While it’s true you cannot ban a ‘belief’, we CAN ban the PRACTICE of a belief. Islam is clearly an evil belief system and like other evil beliefs, it’s practice – it’s execution certainly needs to be stopped. Islam as a religion is not intellectually respectable. Political Islam should be made a world crime. There can be no compromise in the age of nukes. The Muslim World must be isolated, quarantined, contracted, and dissolved, hopefully after a mass apostasy. The most important step to take is nuking Mecca, home of the evil idol, to prove that Allah has no mojo, and Muhammad is a fraud. As an Orthodox Catholic whose church has long been persecuted by Islam, Spencer’s b.s. is understandable but despicable. He even banned me from posting on his site so he could issue statements such as “nobody is talking about attacking Mecca”. He is no leader, just a two-bit scholar who found a good income in a bad economy. Geller is a Zionist Jew, and as such she knows that Israel’s very existence is at stake, so she’s likely to break ranks with him. Of course, Israel needs to nuke Iran to destroy its nuclear facilities after announcing a Zero Tolerance for Centrifuges policy. Knowing history, I don’t want it to repeat. Every country that underestimated Islam was bloodily absorbed, and its culture destroyed in the amalgamation process. The future doesn’t belong to Islam. It must go, it really must go. Only Uncle Sam has the might to stand up to it and finish it as a threat forever, but the entire non-Muslim world needs to unite to make it happen as fast and bloodlessly as possible. Too bad, we have traitors in high places right now, but they too shall pass, since they are only a thin film of scum on top of the pond. Good work. Keep it up. My vast educational resources remain free to all on the Internet. Which is better, to tell a child not to smoke cigarettes “because Daddy said so,” or to explain to the child that cigarettes cause cancer and heart disease and that they will significantly shorten his life? Banning something often makes people more intent on embracing it. It would be better to educate people about the evils of Islam and the inhumanity of Sharia Law so they will reject Islam out of personal conviction rather than because some authority figure banned it. Islamic ideology is indefensible in the 21st Century, and that is why the OIC is striving so hard to “ban” all criticism of Islam. All this squabbling among the critics of Islam only dilutes the mission and wastes our energies fighting the wrong issue. A “litmus test” doesn’t fret over nuances — something is either acid or base. Let’s support any “base” individual or group that is opposed to the corrosive “acid” of Islamic ideology. Sorry Chris, that is a recipe for disaster that can be seen across the West. Did we let Nazism run wild during WW2? We are not going to win this war by being nice, and it would not be banned because “authority figured” wanted it banned. It would be because the people wanted it. Chris, this will not work because it is hard enough to get non-Muslims to fight this fight. Let alone do it perpetually. Meanwhile Muslims will not stop pushing. Maybe in entirely Islamic countries, Muslims need to be weaned from Islam. Maybe. In non-Islamic countries, Angola, UK, France, the United States, etc., I see no problem banning Islam. I completely disagree. There is no chance for a peaceful world if islam is in it. It must be banned; it’s the only way. Give them an inch and they’ll take 50,000 miles. No. Just no. Common sense Susan. For some reason Mr. Spencer cannot figure that out, or for some reason does not want to admit it. I totally agree. Why? Here is an example. If I started an organization (call it a “religion”, call it an “ideology”, call it a “political party”) whose founding documents I created called for the death of certain groups of people (as Islam’s founding documents clearly do), and my followers carried out such killing, what would be the reaction to my organization. I have no doubt it would be outlawed. If my organization demanded that, through intimidation and violence if necessary, that it is supreme and every other belief ought to be suppressed, and my followers carried out such intimidation and violence toward that end, I have no doubt my organization would be outlawed. Why isn’t the same sanity applied to Islam? Islam only called for the removal of paganism from the Arabian Peninsula other than that there’s always been coexistence with people of other faiths. It’s bs that ppl always share due to ignorance and fear that Muslims must take over the world. Muslims only must call to the religion. And defend their own rights. Peace. Wrong, it is called knowledge. Here is some for you. Sahih Muslim Book 019, Hadith Number 4366. Chris, you just cannot expect any shred of coexistence with an ideology that is bent on killing, conquering, or enslaving you. Period. I am with you AI732! Yep, as soon as I read Geller’s first blog entry, I washed my hands of her. Same with Spencer. I emailed Geller asking for my $75. refund for when I went to see her speak in Toronto a week prior to Robinson crossing over to Mordor. He admitted he wanted Islam to takeover within the law. But that debate format was new and really not for me. islam should be outlawed entirely. Just like ACT for America, and possibly just like the last few US Presidents and recent Popes, Geller and Spencer choose not to be totally truthful in order to maintain credibility in a severely distorted, truth-averse world. They all likely know the truth – that no other religion can co-exist alongside supremacist and intolerant Islam, but there is a side to all of them that longs for political correctness. While we hear them often say “truth is the new hate speech”, they do not want to go the last mile to reveal the WHOLE truth. We have truth by degrees. Geller and Spencer are at least 175 degrees more truthful than the Presidents and Popes. I fully understand your point, but I do not see us winning this war without revealing the whole truth. We are losing ground to Islam on a daily basis. It’s always these inbred retards from the most stagnate gene-pool in the history of mankind, making demands with some yadda yadda “izlaHamophobia” and WE always give in, or go along with fully from the get go…while holding the stronger hand. I am all for a ban of Islam, and so are a lot of people I know. Islam is stuck in the past, and that is where it belongs. Where, specifically, should Islam, the religion, be banned? Specifically, are you a citizen of an live within U.S. of A.? If yes, then do you require the repeal of Amendment 1 of The Bill of Rights? Second: what’s the point of “…and so are a lot of people I know”? There is a named logical fallacy for claiming something true for the reason of some number of others agree. Third: Mr. Spencer expressed his opinions about a ban of Islam for/against/equivically within the context of current events of Angola. Fourth: Asserting that YOU want to ban Islam means nothing unless you have a practicable plan. I await the outline of this plan. 1. Islam should be banned from America. I was born in America, and no I am not calling for the 1st Amendment to be repealed. I am calling for Islam to be revaluated and stripped of it’s religion status then banned. You respecting Islam as a religion only shows your ignorance, as it is an ideology of war and perversion. A clear threat to America. 2. The point is that the call to ban Islam is growing. 3.Wrong, he made it clear that he is against banning it anywhere. Either way, you seem to be against banning it so your comment makes little sense. 4. The first step is to greatly turning public opinion against Islam through the education of the ideology. Then Constitutional lawyers will be needed. Now, history shows that respecting Islam as a religion is a slow cultural suicide. So what is YOUR plan to stop it in America? Or maybe you don’t want to. Which would mean that you stand for nothing…..